Follow Shannon’s board Education & Technology on Pinterest. There is TONS of great Ed Tech content out on the Internet these days and sifting through it is time consuming and can even be futile. If you have Ed Tech idols that you follow on Twitter or that blog you may find that they also have a Pinterest account as well. If you are not Pinning or at least following Pinners you should be. It is simple, just create an account at Pinterest.com (it can link to your Facebook if you want) and start following some of your favorite people by clicking on the Pinterest logo from their blog or website. The iPhone recently updated it’s calendar to add a new hybrid look where I can see the agenda and month at the same time! 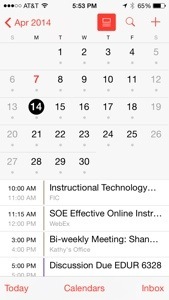 I am very excited about this new look as it makes viewing the calendar more efficient.